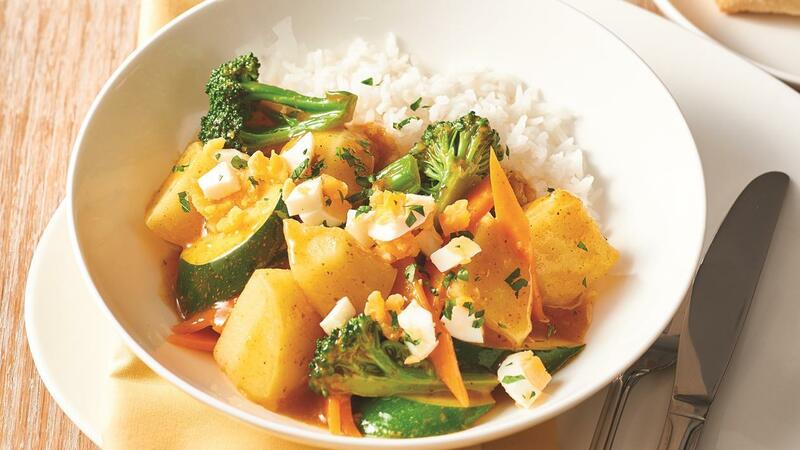 Very versatile KNORR Sakims Chinese Lemon Sauce mixed with some KNORR Patak’s Korma Paste creates a mild flavoured and delicious sauce for this vegetable curry. Hard-boil the eggs, peel and set aside for use. Combine KNORR Patak’s Korma Paste and KNORR Chinese Lemon Sauce GF together and set aside for use. Wash, peel and dice the potatoes, boil or steam until soft. Steam the remaining vegetables until tender. Heat a little oil in a large fry pan and lightly stir fry the vegetables. Add the sauce and continue to cook for 5 more minutes. Serve with the chopped eggs on top. Serve with steamed rice or a sesame topped roll. Tip - Vegetables can be prepared and cooked in advance and stored in a cool room ready to stir-fry.